The governorship candidate of the People's Democratic Party (PDP), Mr. Oseloka H. Obaze, has said Governor Willie Obiano's continued expenditure of the state's resources on media hype and propaganda will not save him from the imminent loss. He said the only thing capable of securing the incumbent another mandate in a state like Anambra is visible dividends of democracy, not hype. Speaking to Oraezue Non Natives, a group of non-indigenes resident in Nkpor, Idemmili North Local Government Area of the state, Obaze said Obiano's reelection bid has continued to suffer immense deficits, despite the enormous resources expended on media and publicity, because his government performed poorly. It was Martin Luther King Jr. who said that “the ultimate measure of a man is not where he stands in moments of comfort and convenience, but where he stands at times of challenge and controversies.” This is not only true but has become a welcome benchmark to examine the integrity of leaders globally. Come November 18, Ndi Anambra will go to the polls to make an all important decision. Armed with their Permanent Voters' Card (PVC), they will collectively decide on the future of the state. Several candidates are running to secure the mandate of the people, but one man distinguishes himself from the rest. 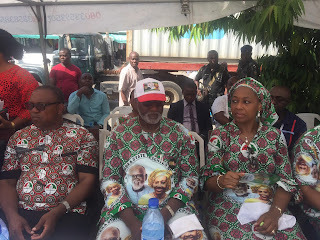 That man is the candidate of the People's Democratic Party (PDP), Mr. Oseloka H. Obaze. Having served four Presidents of the Federal Republic of Nigeria and four Secretaries-General of the United Nations, you won't expect less from the astute gentlemen who is currently wooing Anambra electorate on his campaign trail. Count down to the Anambra governorship election, frontline Christian leaders including the spiritual Director of the Holy Ghost Adoration Ministry, Uke, Rev. Fr. Emmanuel Obimma, popularly known as Ebube Muonso as well as prominent Anglican priest, Ven. Stanley Awuzie have offered supplications for the candidate of the United Progressive Party (UPP) Chief Osita Chidoka. 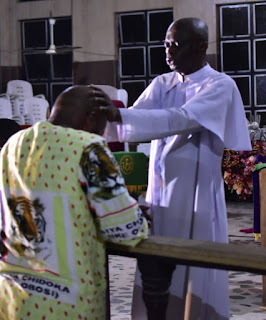 Chidoka, who has been in prayers since the commencement of the campaign, was on Wednesday in a special prayer session at St. Matthews Anglican Church, Egbema, Ozubulu bestowed with the symbolic laying of hands by Ven. Awuzie as a seal of divine validation for the new leadership role ahead. The governorship candidate of the People's Democratic Party (PDP), Mr. Oseloka H. Obaze and his running mate, Barr. Alexandra Onyemelukwu and their campaign train, led by the former Gov. of Anambra State, Mr. Peter Obi were in Lagos today as part of the campaign for the gubernatorial election slated for November 18. The campaign train visited nine markets- Electronics/ Electrical Alaba; Balogun Business Association ( BBA); APT, ASPAMDA, among others.